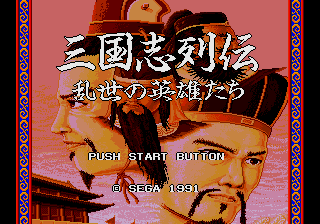 Sangokushi Retsuden: Ransei no Eiyuutachi (三国志列伝 乱世の英雄たち) is a 1991 simulation game by Sega released in Japan — and Hong Kong, where it was called San Guo Zhi Lie Zhuan: Luan Shi Qun Ying (三國志列傳 亂世群英). Whether or not the game has any connections to Koei, who makes the most popular games based around China's Three Kingdoms time periods, is unknown. Main article: Sangokushi Retsuden: Ransei no Eiyuutachi/Magazine articles.